Rent The Mercer Ballroom | Corporate Events | Wedding Locations, Event Spaces and Party Venues. Experience unparalleled service that defines Hilton Family Hospitality. With 105 well-appointed guestrooms, your friends and family will indulge themselves as they enjoy our exquisite hotel amenities. Your wedding day can begin with freshly brewed coffee and a relaxed continental breakfast. From there, spend the day preparing with your bridesmaids. A delivery of gourmet sandwiches and specialty wraps can be arranged for your bridal suite. Say “I Do” in our charming gazebo by the pond. Lush flower gardens provide a picturesque setting for your wedding photos. Your elegant affair will continue with an outdoor cocktail party under our canopied Garden Patio. Imagine 220 of your family and friends dining and dancing in our majestic Mercer Ballroom. Complete the weekend with an elegant brunch to thank your guests for sharing this special day. The perfect setting to schedule your next executive meeting. Impressive details surround your colleagues and reflect the importance of the collaboration that will take place. Comfortably cushioned executive chairs, spacious conference table, ample lighting and comprehensive service areas, ensure that every need is considered and provided. Plan your company’s next seminar, off-site meeting, or training in one of The Mercer Ballroom’s Salons. Each Salon can accommodate groups of 2 to 50. Our on-site meeting coordinator will assist you in every facet of planning so nothing is left to chance. Warm brick floors and a stone knee wall define an elegant outdoor space that is filled with lush green plants and flowers. Comfortable wicker seating and elegantly-draped cocktail tables are covered by an impressive custom canopy complete with hanging chandeliers. Our garden patio is a cozy and visually enticing place to gather for cocktail hour with family and friends. The space provides a truly regal experience for your wedding reception. Gorgeous mahogany framed chairs shine under classic wall mounted sconces. Matching mini chandeliers offer just the right amount of light to set a celebratory mood. The Mercer Ballroom at the Hilton Garden Inn Hamilton comfortably seats 220 guests, so your most cherished family members and friends can attend, enjoy sumptuous food and drink, and dance the night away. 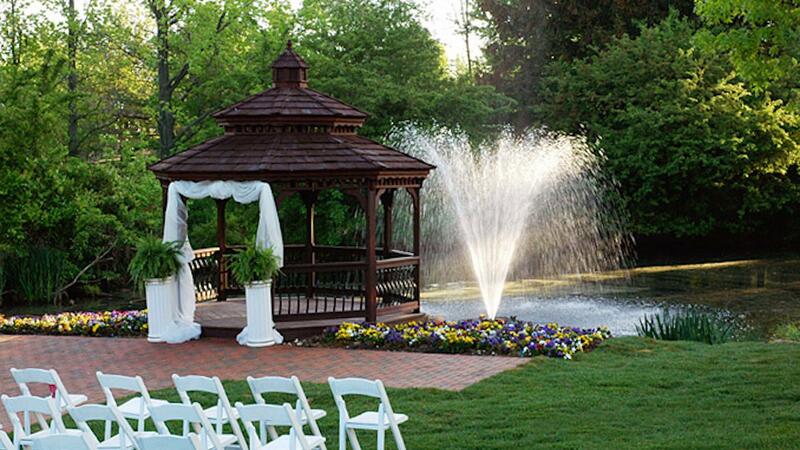 Our pond gazebo is an exquisite spot to exchange vows. Delicate white chairs are gathered together starkly contrasting the lush green grass. The ceremony area is neatly defined by beautiful brickwork setting the stage in front of perfectly shaped and impeccably finished gazebo. The bride and groom face a dramatic trumpet shaped fountain as the soft sound of the water creates a calming and magical experience.